In hospitals of the “developed” world, the vast majority of women give birth in a flat-on-the-back, semi-reclining, or semi-sitting position. Recent research just published shows that these “alternative” positions offer increased room in the pelvis. And many women feel their pain is lessened in these positions. 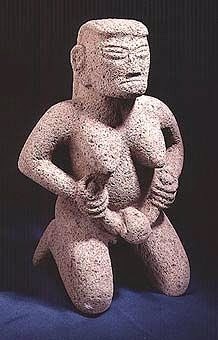 This is probably why they were favored by traditional birthing cultures. A recent Cochrane meta-analysis shows that labors tended to be shorter, the risk for cesarean was lower, and fewer epidurals were used when women in hospitals labored in these positions. So why aren’t more women taking advantage of these positions? 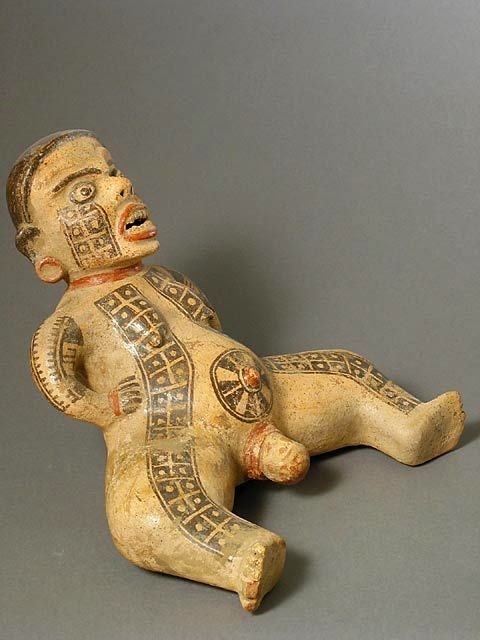 But today, let’s start by showing standard hospital positions for perspective, then contrast those with illustrations of alternative birth positions from historical artwork. 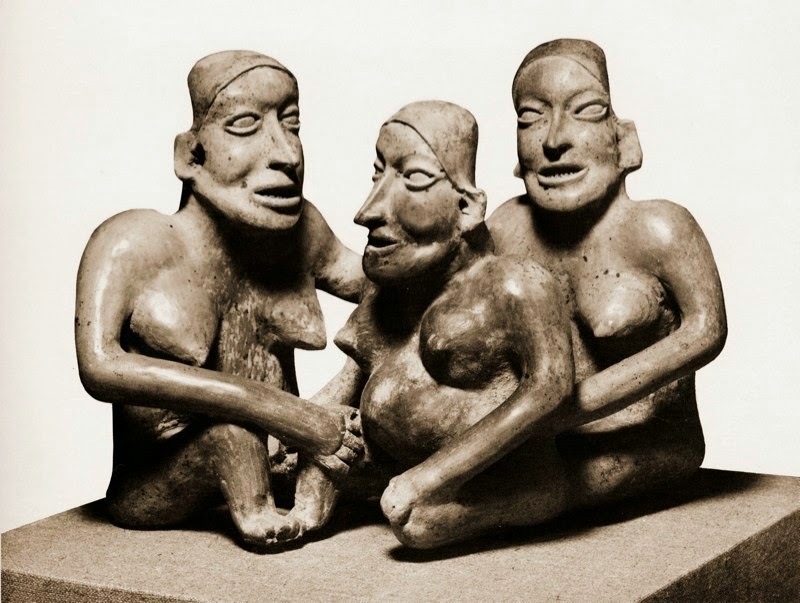 The point is to show the variety of birthing positions used in history and among First Nation peoples today, in contrast to the lack of variety in most hospitals. 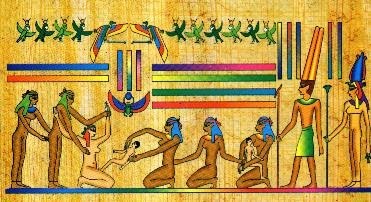 For some time, I have been collecting illustrations of birthing positions in various cultures and time periods from around the world. It’s been a fascinating and educational process. A list of sources for them is available at the bottom of the post in the References section. Note that there are even some plus-sized images! In the hospital today, some care providers restrict the mother’s position while in labor or while pushing. Many women are required or strongly pressured to lie back or to use a semi-sitting, splayed position with legs raised and pushed back or out. Even when care providers do not specifically restrict birth positions, women still usually end up in positions like the following ones. 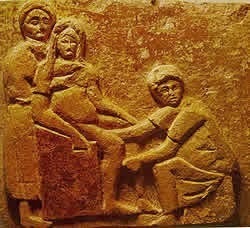 This is a “lithotomy” or fully reclined position, with legs splayed strongly apart in stirrups to give the doctor as much access as possible. A “dorsal recumbent” position is basically the same, except that the patient’s legs are not in stirrups but are flexed and on the bed. 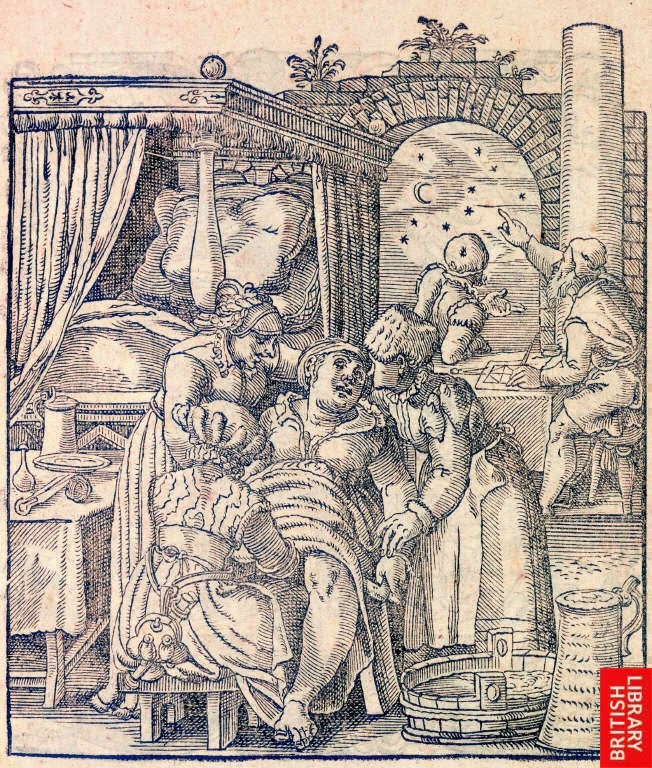 One major issue with the lithotomy and semi-recumbent positions is that not only do they not utilize gravity to use the baby’s own weight to help it move down, but they actually make the mother work against gravity in order to push the baby out. Another problem with all of these positions is that they actually decrease the size of the pelvic outlet. The sacrum is against the bed, making it hard for it to move during labor. The direct pressure on the woman’s tailbone forces it upwards in a more curved position and into the pelvic outlet space. Pulling the knees strongly apart tends to narrow the pelvic outlet in the back as well. These give less room for the baby to get out. It also tightens the pelvic floor and may make it more likely to tear. 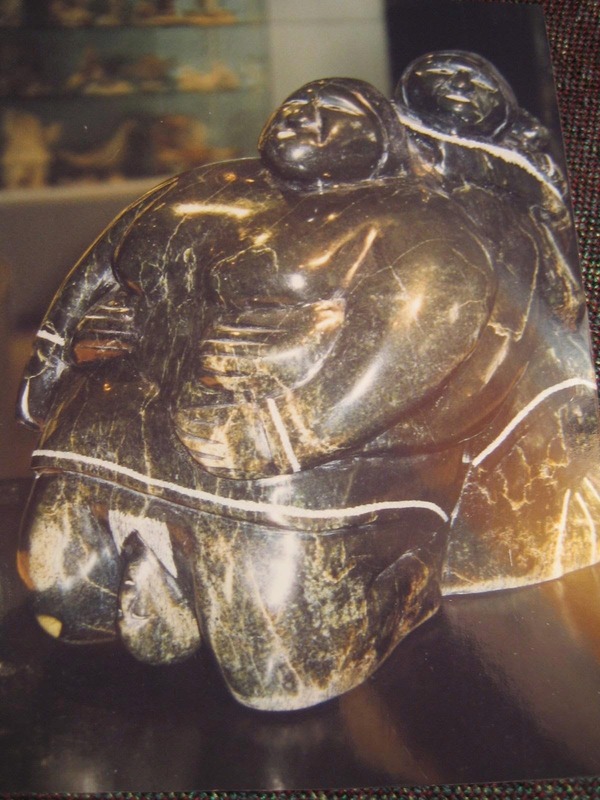 One survey of U.S. birthing women reported that as recently as 2005 that “57% gave birth lying on their backs and an additional 35% gave birth propped up in a semi-sitting position.” In other words, 92% of the women gave birth in either semi-reclining/reclining or semi-sitting positions. If all those women truly want to give birth in those positions, that’s no problem. Some women find them comfortable or useful, and it’s perfectly fine to use them if desired. However, many women report wanting to use other positions and being discouraged or even forbidden from using them. However, it’s always important to point out that there is no one “right” position for laboring or pushing out a baby. All positions have pros and cons.Care providers should encourage women to experiment with different positions and then trust that the woman’s body will tell her the right position for her needs. 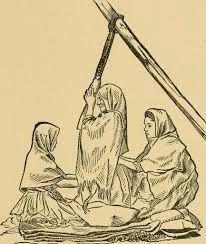 If a woman is not making progress with a certain position, encourage her to try other positions, as these may help the baby move down or turn to help labor progress, but in the end it is the mother who should have the ultimate say in her position. If the traditional semi-reclining or semi-sitting positions feel “right” to you, there is nothing wrong with that. Many babies have been born that way just fine. If you like that position and your baby is well-positioned and descending just fine, there is no need to alter that. In non-Western countries (and outside the hospital in Western countries), many women give birth in so-called “alternative” positions, like squatting, standing, semi-squatting, kneeling, asymmetric (one leg up and one down), all-fours, back arched, or side-lying. Let’s review a few of these “alternative” positions. 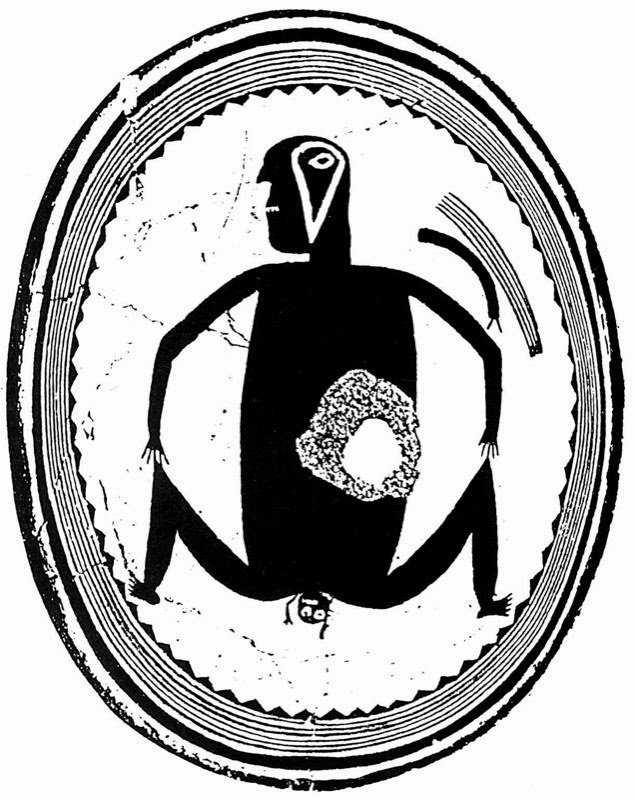 Many tribal societies, from Native Americans to African tribes, have illustrations or statues of women squatting to give birth, like this pottery illustration from the Mimbres Pueblo tribe. Notice that the mother’s knees are far apart. Some women find squatting too tiring to sustain during birth. Many utilize what is called a “Supported Squat” position instead. The most common way to help sustain a squat is to lean on something or to hold onto other people, one on each side. 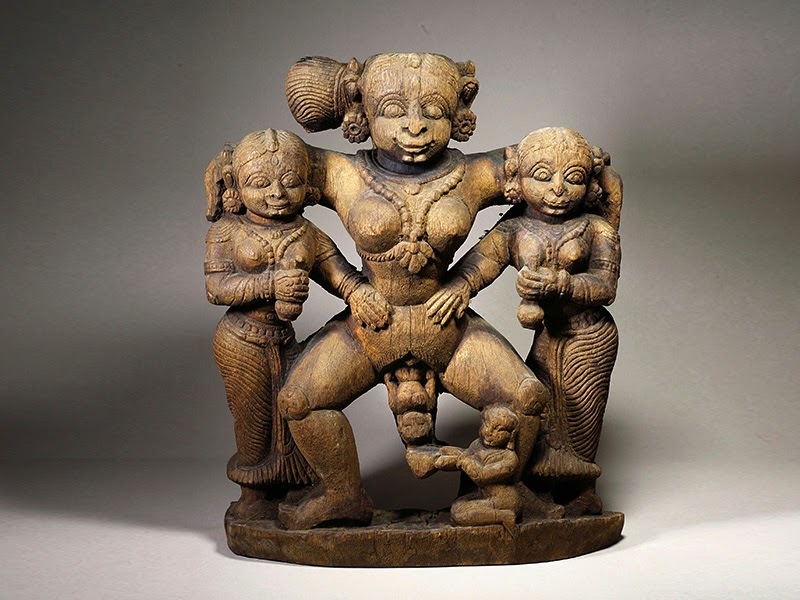 In this South Indian carving, for example, a woman gives birth in a standing squat, holding on to women on each side of her. 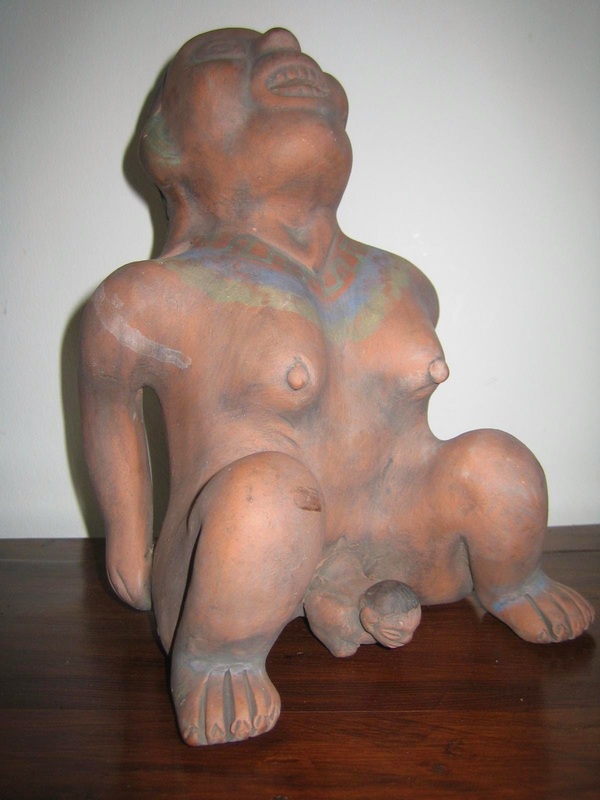 The midwife’s size below shows her relative unimportance in the artist’s mind compared to the mother. 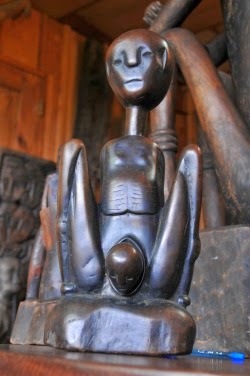 Notice that the mother is shown as the largest and most powerful figure in the carving, probably as a commentary on the power of the birthing woman. 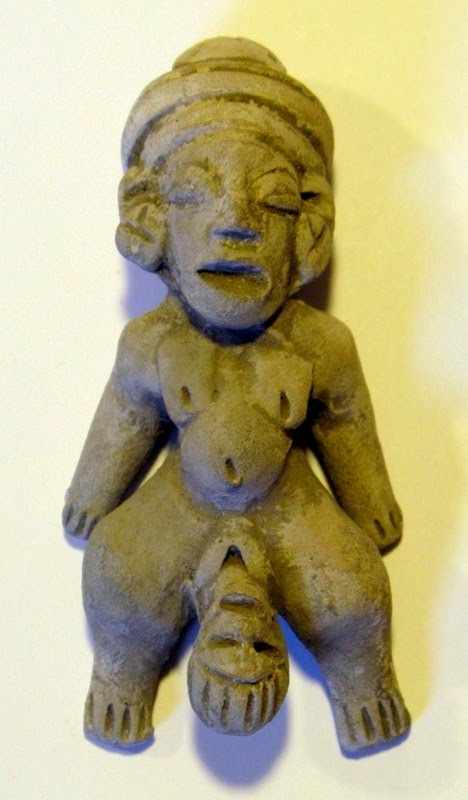 Basically it’s pretty close to squatting in many ways, except the mother is on her knees instead of her feet, and she is fairly close to the ground, as in this statue from Costa Rica. It’s difficult to tell the birth position in this Japanese illustration, but it certainly looks like she is kneeling. 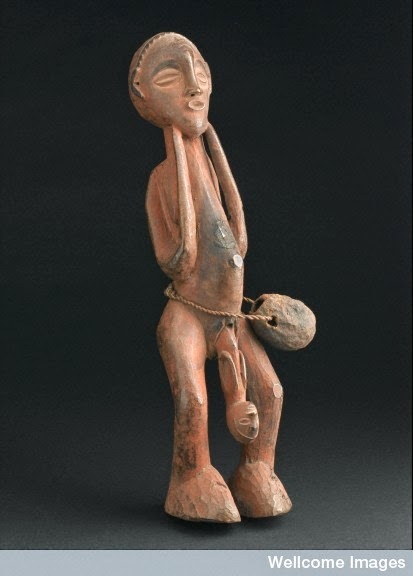 …and this African statue from Cameroon. 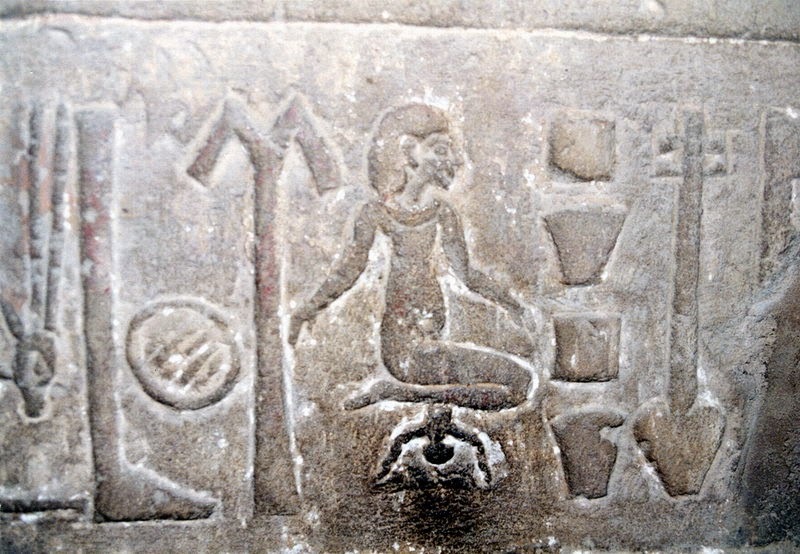 Another position that was popular was a variation of the kneeling position. Today we call this the all-fours or hands-and-knees position, although the mother wasn’t always completely on her hands and knees. 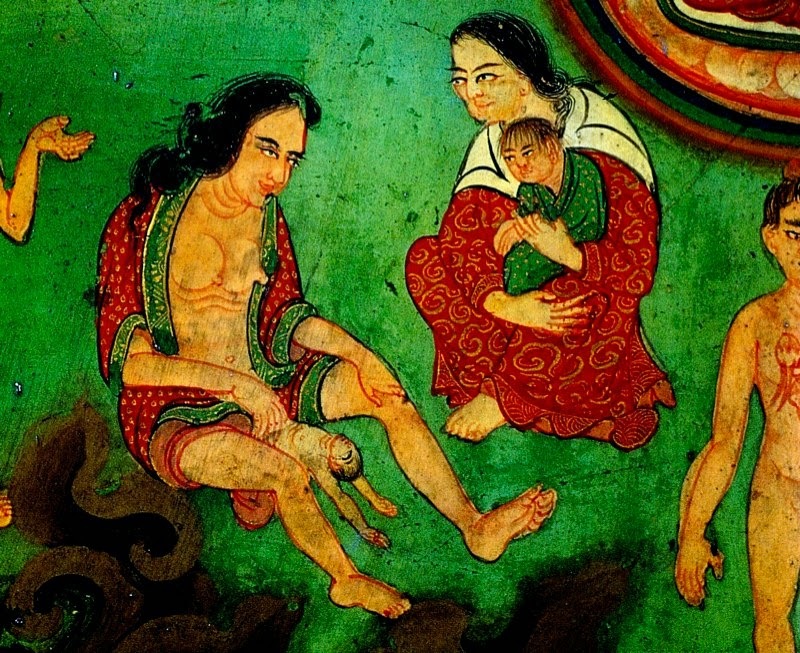 This Indian painting shows a reclined woman giving birth on a bed, though her head is raised a bit. 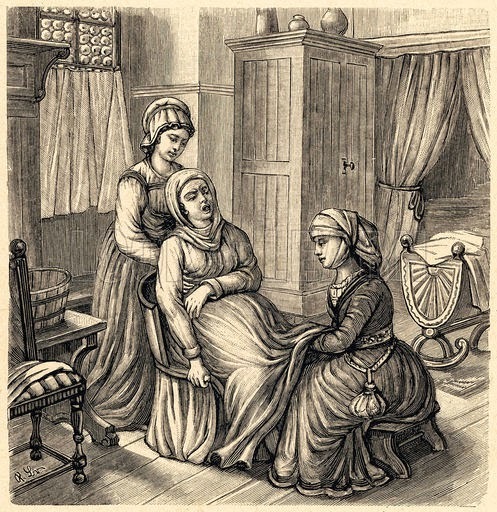 Notice that one of her legs is propped on the midwife’s shoulder while the other is down, giving her an asymmetric position while lying down. 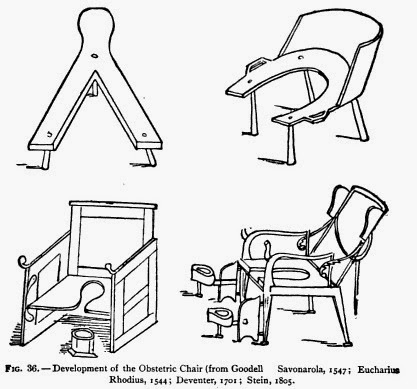 Birth stools of various sorts have been very popular throughout history. 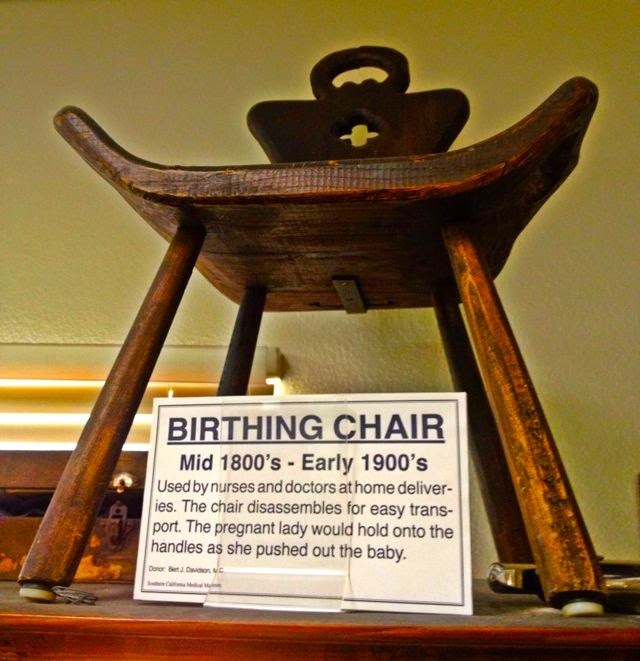 Sometimes the care provider would bring the birthing stool with them to births…. …while other birth stools were family heirlooms, handed down through the family. 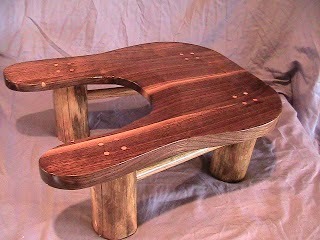 If you didn’t have a birth stool, sometimes you improvised your own version. 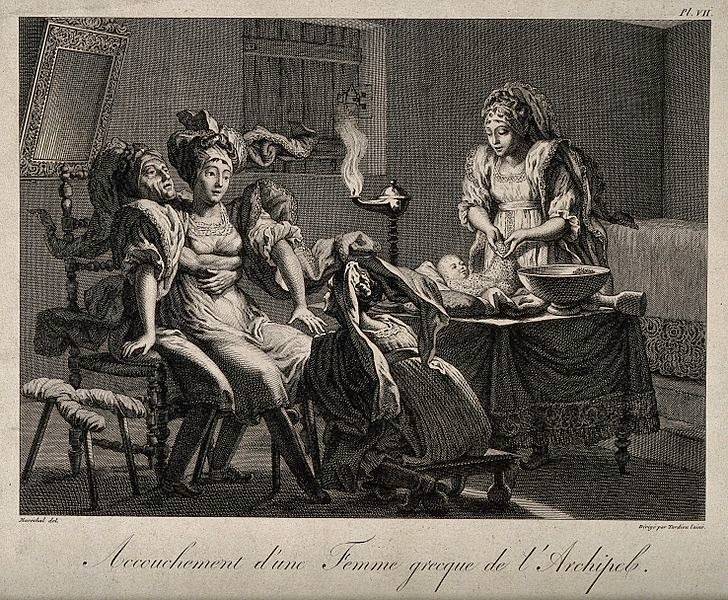 Lap-sitting on someone’s lap was another very popular alternative, as shown here in an early American illustration. 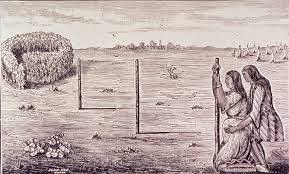 This position was very common among the settlers along the frontier. 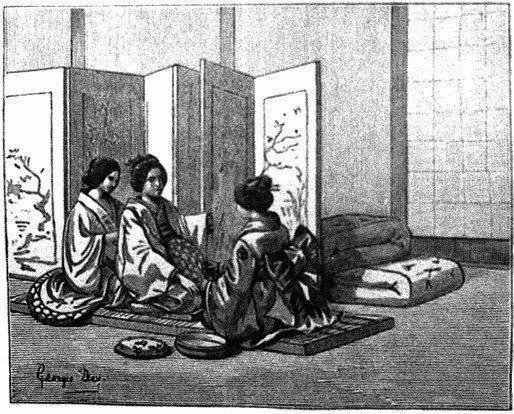 The husband sat on a chair, and another chair was placed on its front on the floor in front of the first chair to support the mother. This created a sort of poor woman’s birth stool. (Alternatively, a sheet was placed over the husband’s lap to create a sling for the mother to sit on.) 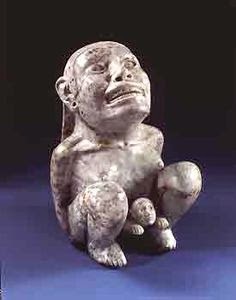 The birth attendant sat on a smaller improvised stool in front of the mother. The husband helped support the mother as she shifted between semi-sitting, semi-squatting, and standing positions. 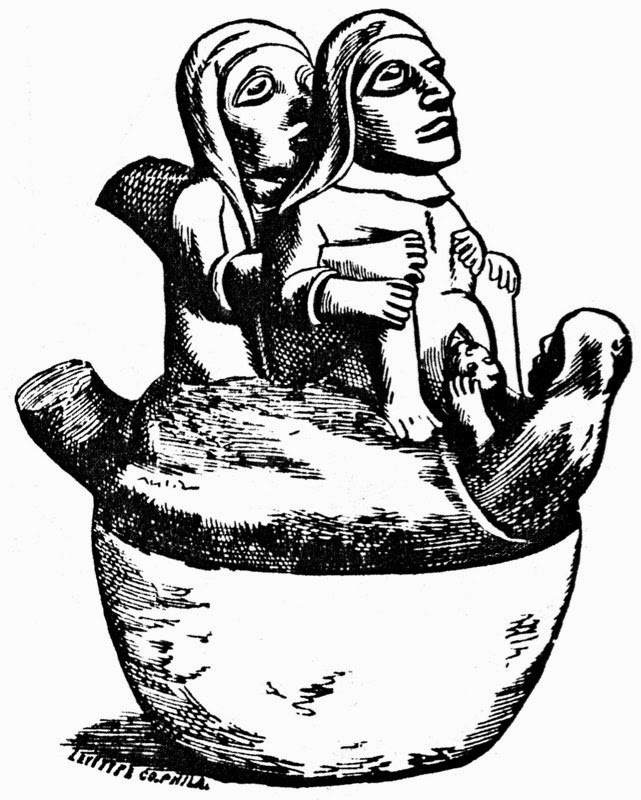 In this illustration of the Kiowa Indian tribe from the North American plains, a helper in front blows into the mouth of a mother standing to birth, while the midwife catches the baby from behind. 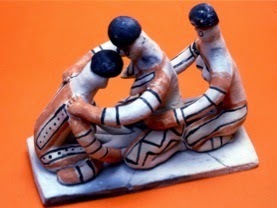 It is not clear what the blowing is for, but probably was used as a focus or distraction technique, to help with breathing techniques for pain relief, or as a symbolic “blowing in” of strength. 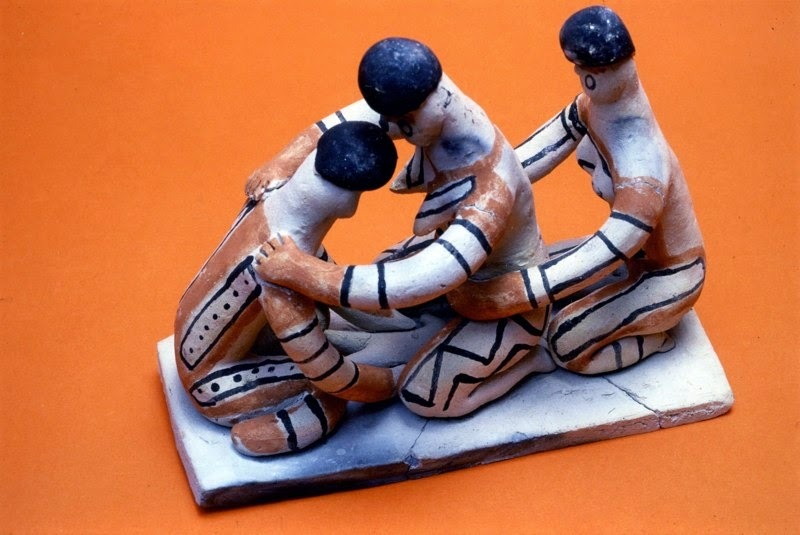 For example, as this “Pioneer Birth Scene” illustration shows, women would often sit on their husband’s lap to imitate a birth stool, half-stand or pull against someone in front of them during a contraction, then lean back and rest on their husband between contractions. 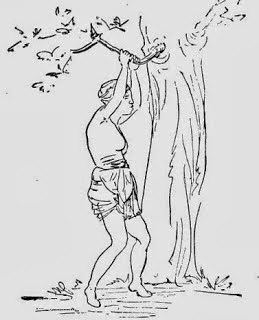 Some cultures used a rope tied to a tree or a cloth tied to something, as in the above illustration of an African American woman from the South. This helped the woman to be in a standing squat position. The rope helped support her weight so her legs wouldn’t get as tired. 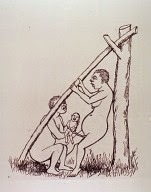 Dr. George Engelmann, a physician who wrote a book in 1884 about birthing practices around the world (from which many of these illustrations are taken), notes that dangling or upright kneeling positions were common among many tribal peoples, and nearly always involved a change in the direction of the body’s axis as the birth neared. In most hospitals, women are encouraged to round their backs forward and put their chins to their chests to assume what some call the “C” position. This is thought to help the baby move towards the more roomy back section of the pelvic inlet, negotiate the curves of the pelvis, and make more room for the baby engage and move down. 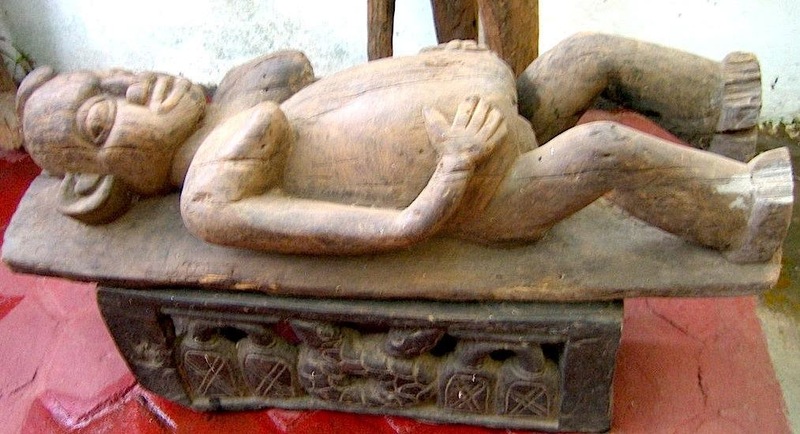 And indeed, many historical birthing positions make use of a forward-leaning (if more upright) tilt. 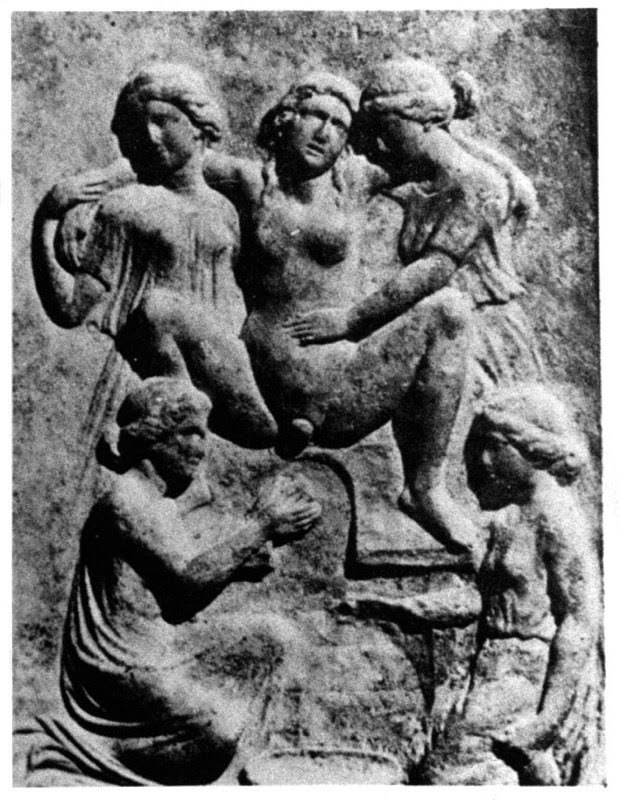 If you look closely, this ancient Cyprus birthing scene shows the mother lying back and arching her back somewhat. Certainly she is not curled forward into a “C” position. Although this is right after the birth of the baby and she could just be lying back to rest, her position suggests that this is how she actually pushed out the baby. However, that doesn’t mean that this position is not potentially useful for other birth situations. In fact, a German doctor named Gustav Walcher described a similar position over a century ago. 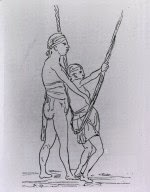 The website, Spinning Babies, has a whole page devoted to Walcher’s Position, with several illustrations and historical details. In Walcher’s Position, the woman is scooted to the edge of a high bed, arches her back, and lets her legs passively hang over the edge of the bed and dangle. If a high-enough bed is not available, extra cushions or a trochanter roll (such as those used in yoga or massage) are put under her hips to create the needed angle of arch. This is supposed to be an excellent position for helping a high baby engage into the pelvis and to open up the pelvic brim. They also note that the position is sometimes used for breech births or for resolving shoulder dystocia. Dr. Engelmann also noted this tendency among many of his European-American recumbent births last century. 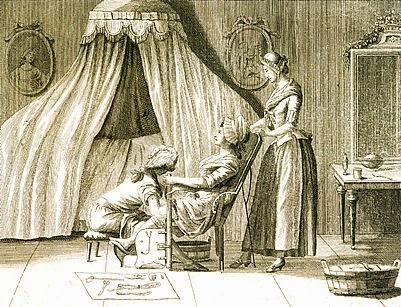 As shown in this illustration from his book, the European-American mothers he attended who labored in in a reclining position often found a way to pull up and raise themselves for the actual birth of the baby. 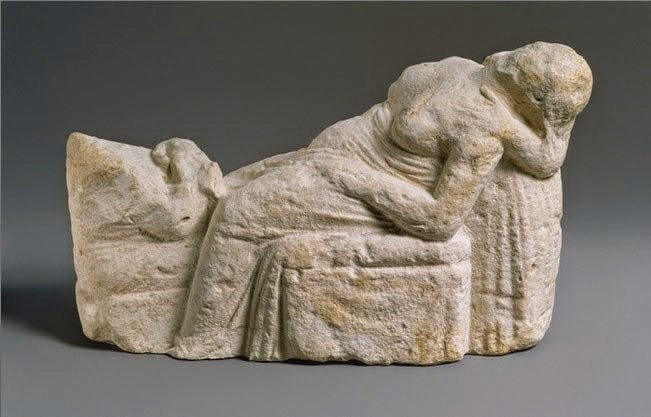 He called this a semi-recumbent position, but if you look closer, she is certainly not in the curled forward “C” position of most modern semi-recumbent labors; she is pulling backwards and arching away as she pulls on the bedsheet. It’s one thing to encourage a rounded back and forward-leaning posture because that may help most babies engage or move down better in general, but it’s another to discourage or forbid a back-arching movement to women whose bodies are telling them that they need to do this. Care providers need to trust more in women’s instinctive moves in labor instead of imposing one way of doing things. If a woman feels she needs to arch her back in labor or pushing, she should give it a try and see if it is helpful. The proof is in the results; if it doesn’t help she can always go back to the “C” position. An excellent alternative position if the mother is tired or feels more comfortable lying down is the side-lying or lateral position. The mother’s top leg can be abducted and propped up by a helper or squat bar, or rolled far over the other to create a kind of asymmetric position (called a Sim’s position in modern obstetric literature). In this way, pressure on the sacrum and tailbone can be avoided, room in the pelvis can be maximized, yet the mother can still rest lying down between contractions. Instead, during pushing, most women are pressured to be on their backs in the “stranded beetle” lithotomy position, or forced to curl forward in a semi-sitting C position, reducing the room available in the pelvic outlet. They are strongly directed to engage in forceful “purple pushing” that often bursts capillaries in the eyes, exhausts the mother, and reduces oxygen levels to the baby. This is not good for either mother or baby. Alternative birth positions and less directed pushing offers the advantage of a more physiological and effective pushing. 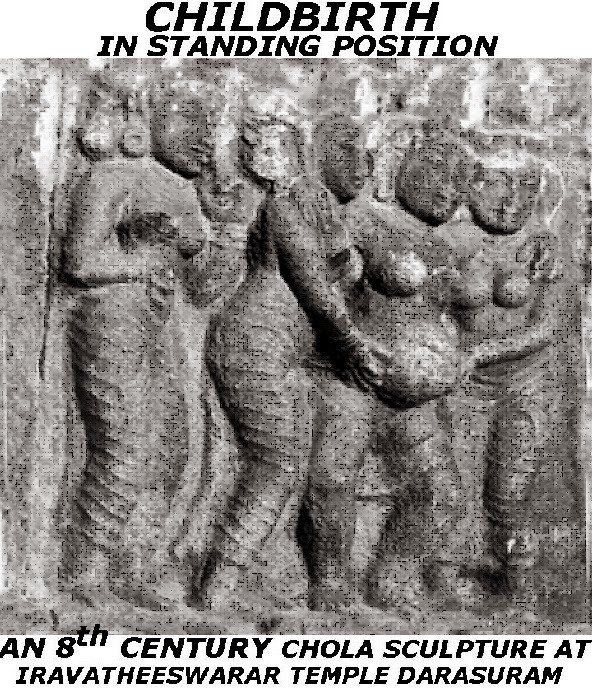 Of course, the point must be made that just because traditional cultures used alternative birthing positions doesn’t automatically make those positions better. Many questionable and even harmful practices were used across a variety of cultures and time periods; older or “traditional” doesn’t necessarily mean better. It is important to subject traditional practices to research to see if they are beneficial or not. It’s very telling that when a woman is given the freedom to move in labor and is not told what position to use, she often moves into these alternative positions. 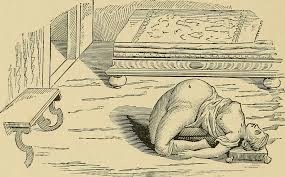 And as Dr. Engelmann noted, even women laboring while lying down will often instinctively try to alter their position near the end of labor by raising up, arching their back or lifting their bottoms, or otherwise altering the axis of their bodies. 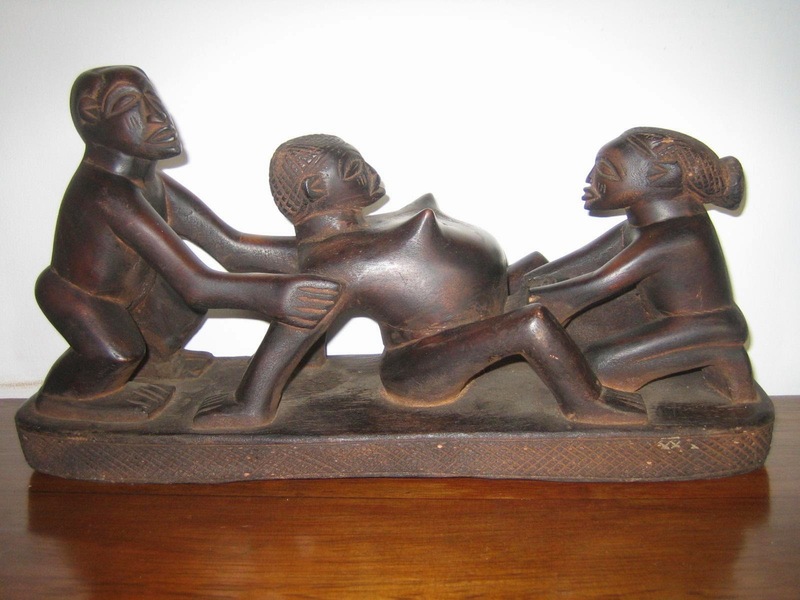 Many birth attendants can testify that some non-progressive labors suddenly get “unstuck” and progress quickly once the mother is able to move freely in birth. What may seem like random or counter-productive movements to the observer may actually be just what the mother needs to free up a shoulder or help a baby finish turning to an easier position for birth. I can’t end this post without including the beautiful Brazilian film, Birth in the Squatting Position. This doesn’t mean that I think squatting is the best way to give birth; some people like to use it, some don’t. I think you should move around and find whatever position most suits you ─ and that position may change from birth to birth, depending on the position of the baby. In the end, it’s important to reiterate that there is no “right” position for birth. You don’t get extra points for having birthed while squatting or standing up. If the usual hospital positions work well for you, that’s just fine. But many women find they have less pain, feel more in control, need less pain medication or other interventions, and give birth more easily in some of these alternative positions. All women should have the option of using them, and care providers should be more encouraging of them in the hospital. While pregnant, take time to “practice” labor in many different positions. 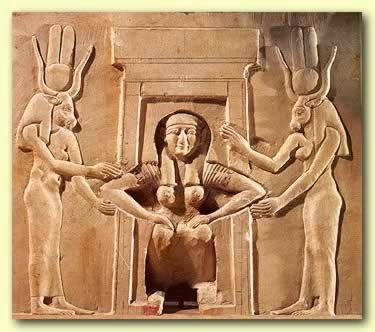 If you haven’t tried the position during pregnancy, chances are you won’t try it during birth, especially at the hospital where we are culturally conditioned to be in bed. Schedule a “Labor Rehearsal” and try different positions on to see how they feel in your body. This will give your body a somatic vocabulary and kinesthetic memory of different position possibilities that you can try during labor. Once in labor, trust in your body’s ability to tell you what you need. Try different positions and adjust as needed. Listen to the dictates of your body but also be willing to try ideas from others to see what works best for you. In the end, though, remember that you are the ultimate authority of what works best for your body and baby. OBJECTIVE: The purpose of this study was to assess the impact of different positions on pelvic diameters by comparing pregnant and nonpregnant women who assumed a dorsal supine and kneeling squat position. STUDY DESIGN: In this cohort study from a tertiary referral center in Germany, we enrolled 50 pregnant women and 50 nonpregnant women. Pelvic measurements were obtained with obstetric magnetic resonance imaging pelvimetry with the use of a 1.5-T scanner. We compared measurements of the depth (anteroposterior (AP) and width (transverse diameters) of the pelvis between the 2 positions. RESULTS: The most striking finding was a significant 0.9-1.9 cm increase (7-15%) in the average transverse diameters in the kneeling squat position in both pregnant and nonpregnant groups…CONCLUSION: A kneeling squat position significantly increases the bony transverse and anteroposterior dimension in the mid pelvic plane and the pelvic outlet. Because this indicates that pelvic diameters change when women change positions, the potential for facilitation of delivery of the fetal head suggests further research that will compare maternal delivery positions is warranted. OBJECTIVE: The aim of our study was to measure the impact of supine and upright birthing positions on MR pelvimetric dimensions. MATERIALS AND METHODS: MR pelvimetry was performed in 35 nonpregnant female volunteers in an open 0.5-T MR imaging system with patients in the supine, hand-to-knee, and squatting positions. The obstetric conjugate; sagittal outlet; and interspinous, intertuberous, and transverse diameters were compared among positions…CONCLUSION: An upright birthing position significantly expands female pelvic bony dimensions, suggesting facilitation of labor and delivery. BACKGROUND: It is more common for women in both high- and low-income countries giving birth in health facilities, to labour in bed. There is no evidence that this is associated with any advantage for women or babies, although it may be more convenient for staff. Observational studies have suggested that if women lie on their backs during labour this may have adverse effects on uterine contractions and impede progress in labour, and in some women reduce placental blood flow…Results should be interpreted with caution as the methodological quality of the 25 included trials (5218 women) was variable….AUTHORS’ CONCLUSIONS: There is clear and important evidence that walking and upright positions in the first stage of labour reduces the duration of labour, the risk of caesarean birth, the need for epidural, and does not seem to be associated with increased intervention or negative effects on mothers’ and babies’ well being. Given the great heterogeneity and high performance bias of study situations, better quality trials are still required to confirm with any confidence the true risks and benefits of upright and mobile positions compared with recumbent positions for all women. Based on the current findings, we recommend that women in low-risk labour should be informed of the benefits of upright positions, and encouraged and assisted to assume whatever positions they choose. …OBJECTIVES: To assess the benefits and risks of the use of different positions during the second stage of labour (i.e. from full dilatation of the uterine cervix)…MAIN RESULTS: Results should be interpreted with caution as the methodological quality of the 22 included trials (7280 women) was variable. In all women studied (primigravid and multigravid) there was a non-significant reduction in duration of second stage in the upright group…a significant reduction in assisted deliveries…a reduction in episiotomies …an increase in second degree perineal tears…increased estimated blood loss greater than 500 ml…fewer abnormal fetal heart rate patterns…In primigravid women the use of any upright compared with supine positions was associated with: non-significant reduction in duration of second stage of labour…this reduction was largely due to women allocated to the use of the birth cushion. AUTHORS’ CONCLUSIONS: The findings of this review suggest several possible benefits for upright posture in women without epidural, but with the possibility of increased risk of blood loss greater than 500 mL. Until such time as the benefits and risks of various delivery positions are estimated with greater certainty, when methodologically stringent data from trials are available, women should be allowed to make choices about the birth positions in which they might wish to assume for birth of their babies.